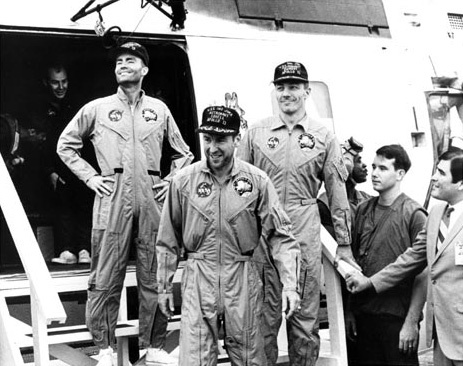 Forty five years ago today, as the nation held its collective breath, Apollo 13 successfully splashed down in the Pacific Ocean. 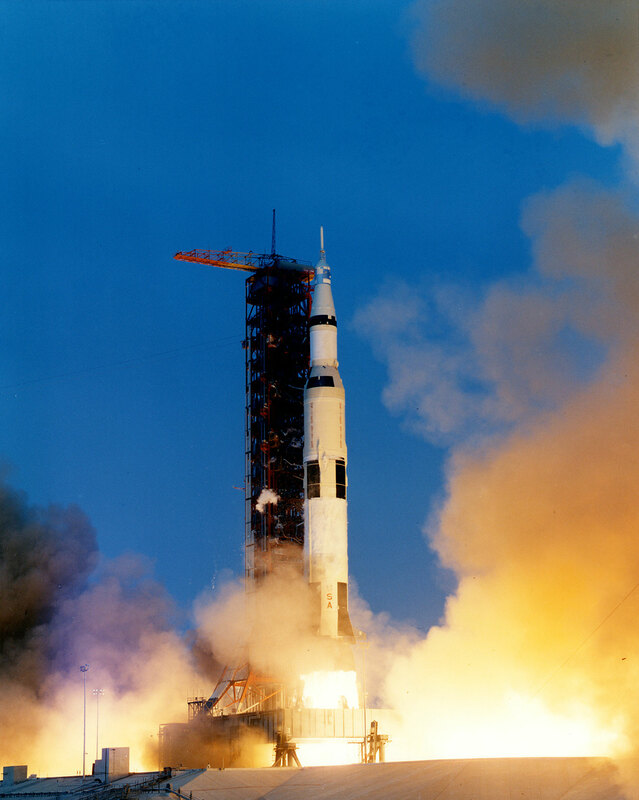 Jim Lovell, Fred Haise Jr., and John “Jack” Swigert had lifted off from Launch Complex 39A from NASA’s Kennedy Space Center atop a Saturn V rocket on April 11, 1970, on what the public had considered a “routine” mission to the Fra Mauro formation on the Moon. As the week progressed, the mission became anything but routine and ended up requiring the work of hundreds of people on Earth to bring the astronauts home from what could have been a fatal mission. Apollo 13 launch April 11, 1970. Housed inside the Command Module Odyssey, the crew launched on what was supposed to be the third crewed landing on the lunar surface. Minutes into the flight, the second stage center engine cut off 2 minutes earlier than planned. The crew recovered by burning the remaining engines a bit longer to compensate, ensuring that they were able to get into the proper orbit and successfully dock with the Lunar Module Aquarius. Fifty six hours into the mission, at a distance of 205,000 miles (330,000 km) from Earth, the crew had just finished a television broadcast. Swigert was directed to “stir the tanks” – a housekeeping procedure to activate fans within the Command and Service Module’s oxygen tanks to prevent them from stratifying and avert an accurate reading. A few minutes later, the crew heard a “loud bang” and instrumentation alarms started ringing. The number-2 oxygen tank in the service module had exploded, blowing out an entire side of the service module and damaging the remaining O2 tanks and fuel cells. “Houston, we have a problem,” Lovell said, after NASA asked them to repeat their initial transmission. Shortly afterwards, Lovell noticed gas outside streaming past the window and it was deduced that it was the oxygen. The remaining fuel cells shut down placing the command module on limited battery power with no way to recharge them. 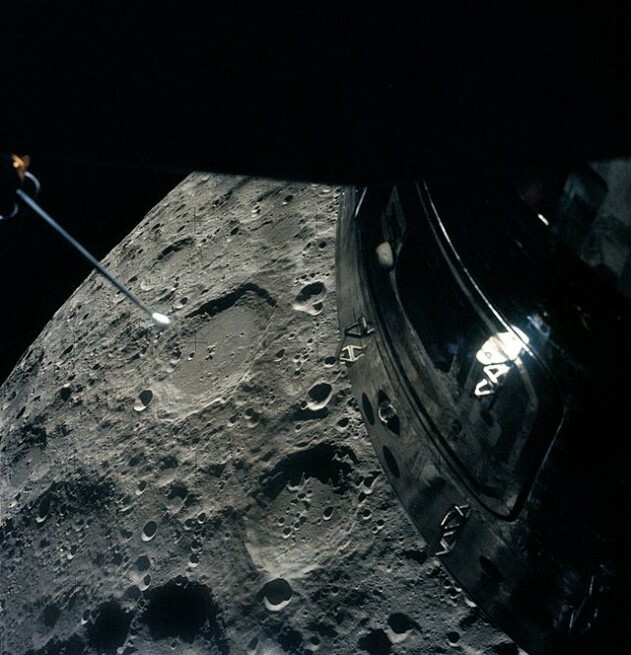 The crew shut down the command module in order to save power and moved into the lunar module to use it as a life boat. Flight Director Gene Kranz ordered the Apollo 13 mission to be aborted, and now the goal was to bring the crew home alive. A slingshot around the Moon was decided as their best option which also gave them more time to work out a re-entry plan. During the flight back home, a dangerous level of CO2 started to build up, which threatened the crew. Aquarius’ CO2 scrubbers were designed to remove carbon dioxide from the internal atmosphere of the ship for a crew of two for one and a half days, but Aquarius was now carrying a crew of three. Filters from Odyssey could not be used due to their being a different size, so a team at Mission Control found a way to adapt the CM filters using only the equipment that was found on the ship. They were successful in their design and the Apollo 13 crew was able to replicate the design, called the “mailbox”, and reduce the CO2 levels. Aquarius operated on batteries and, due to the need to conserve power, the LM power was reduced to the lowest levels possible. This caused the temperatures within the LM to drop to about 40 °F (4 °C). Water began to condense on the panels within both ships, causing concerns of possible electrical shorts during the CM power-up prior to re-entry. Due to the increased insulation added to the wires after the Apollo 1 fire, the electrical system powered-up without incident. Power-up of Odyssey was a concern, however. No CM had ever been powered-up before while in space. Due to the limited battery power, Mission Control had to come up with a start-up plan using the least amount of power possible. Mattingly, who was bumped from the mission due to his exposure to the measles, played a role in coming up with the proper routine. The service module’s reaction control system (RCS) is usually used to safely move the CM away from the LM during separation, but with the service module out of commission due to the explosion, Grumman Corporation (designers of the LM) called upon a team from the University of Toronto to come up with a new procedure for separation. They had only one day to accomplish the task, and came up with an ingenious solution. The Apollo 13 crew was to pressurize the tunnel between Odyssey and Aquarius to a specific level prior to separation. When the two spacecraft separated, the pressure inside the tunnel would gently push them both apart as it released into space. The crew, aboard the CM Odyssey, continued on to re-entry. Normally during re-entry, communications are blacked out for four minutes due to the Command Module being surrounded by hot, ionizing plasma. However, Apollo 13’s blackout lasted 87 seconds longer than had been expected, prompting fears that the heat shield had been damaged in the explosion three days earlier. 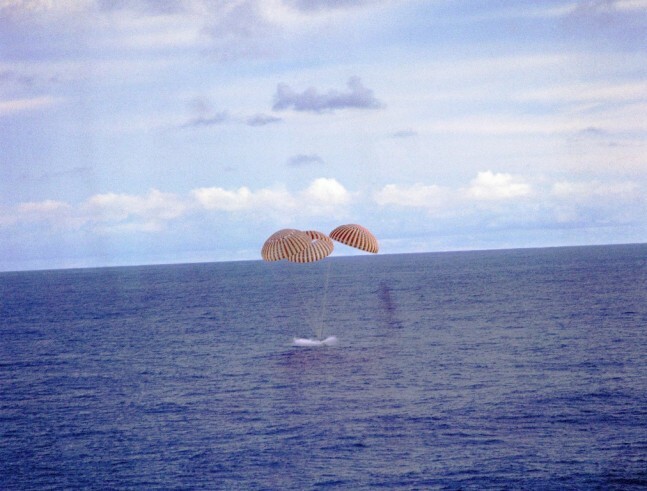 Fortunately, it was not, and Apollo 13 safely splashed down in the Pacific Ocean four miles from the U.S.S. Iwo Jima recovery vessel. NASA deemed the mission a “Successful failure”, because they had failed to land on the Moon, but succeeded in getting the crew home safely. It was later determined that the explosion was caused by a damaged fuel tank that had been dropped prior to the mission. At the time, it was determined that the tank had suffered no damage, but after review of the documentation and pictures taken at the time, that determination was found to be incorrect by a review board. The story about the damage to the LOX tank that I have heard from multiple sources doesn’t involve dropping the tank. Rather, it was a result of a using the tank heaters to speed up clearing out LOX after tests. The higher the temperature, the faster you could empty them, but that particular tank was subjected to a high enough temperature than it damaged the insulation. When the stirrer was turned on, there was a spark, and the rest is history. Which of these is correct, or are they both correct? According to Wikipedia, Apollo 13 (Review board report): “[…] During removal, the shelf [carrying the oxygen tanks] was accidentally dropped about 2 inches (5 cm) because a retaining bolt had not been removed. The tank appeared to be undamaged, […]. After the tank was filled for ground testing, it could not be emptied through the normal drain line. To avoid delaying the mission by replacing the tank, the heater was connected to 65-volt ground power to boil off the oxygen. […] When the thermostat opened, the 65-volt supply fused its contacts closed and the heater remained powered. This raised the temperature of the heater to an estimated 1,000 °F (540 °C). […] The sustained high temperatures melted the Teflon insulation on the fan power supply wires and left them exposed. When the tank was refilled with oxygen, it became a bomb waiting to go off. […]”.